THE PICKIEST EATER IN THE WORLD: POULET MANILLE: GAGNANT GAGNANT, POULET DÎNER! My doctor recently encouraged me to eat less pork, and instead try to incorporate chicken, fish and lean beef into my regular diet. Technically not exactly a mean feat for your average ordinary human being, but for your friendly neighborhood Pickiest Eater, believe me, its harder than you'd think. Who doesn't love Chicken, right? As long as it's not the innards, I'm good with it (Picky Eater, sorry)! 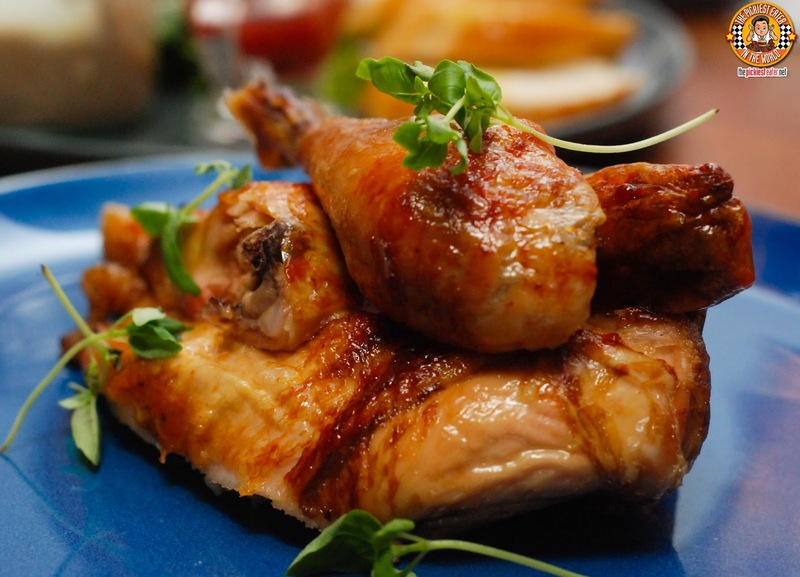 Instead of the oily fast fried chicken that I like to enjoy every now and then, Poulet Manilla offers chicken dishes that are roasted in their French Rotisserie Oven. The chickens that Poulet Manille uses Free Range Chickens From Pamora Farms, that are grown naturally for 75 days. When compared to other popular chicken places that uses chicken grown for 35 days only, you can see the difference in size, as their chicken looks plumper and healthier. 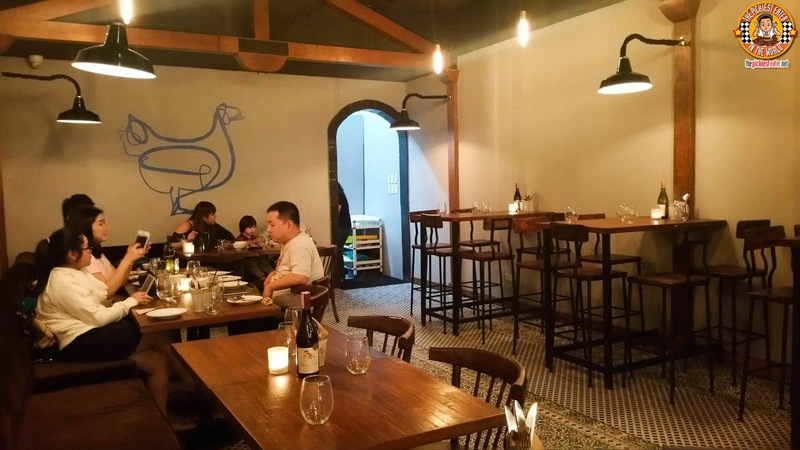 Poulet Manille's interiors invoke a rustic, French countryside feel, that curiously makes you feel right at home. The French Rotisserie ovens are on full display at the open kitchen of Chef Tom Hines, and the aroma alone more than enough to draw you in. Chef Tom also has classic dishes such as Coq Au Vin and Lamb Shank in his lineup. Tempting, yes, but I wanted to focus on the Chicken! 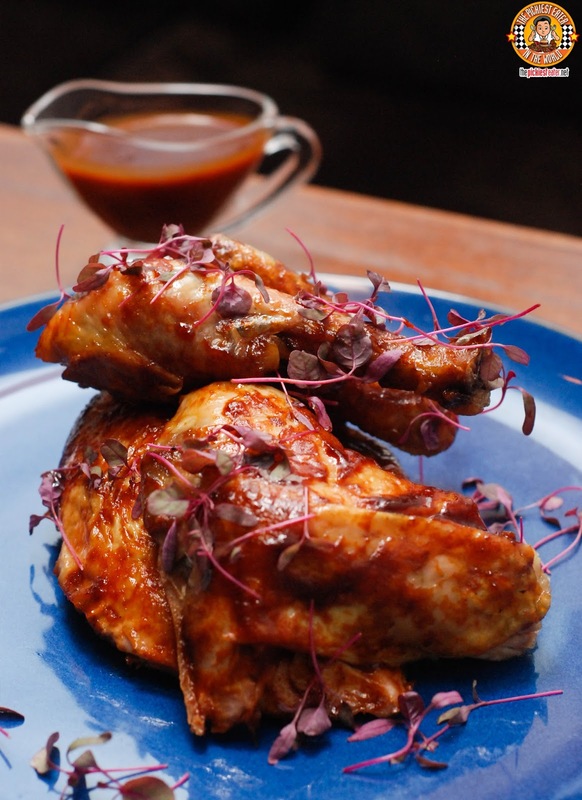 Your orders of Roasted Free Range Chicken comes with your choice of Side orders. 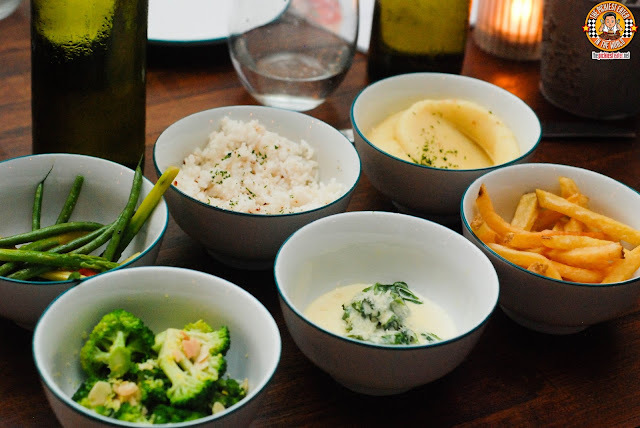 The selection includes Cream of Wild Spinach, Broccoli with Toasted Almonds, Mixed Biodynamic Vegetables and Fragrant Jasmine Rice. But let me make things easier for you. Get Pomme Frites, which is easily among the most addictive french fries I've ever had, the silky, creamy Mashed Potatoes, and the flavorful Roasted Garlic Rice. Poulet Manille offers three types of Rotisserie Roasted Chicken, where you may choose which portion size you prefer; Quarter (P398, with two side dishes). Half (P620, with four side dishes) and Whole (P998, with eight side dishes). First up was the French Country Classic. With this roast, the pure flavor of the chicken is the star. 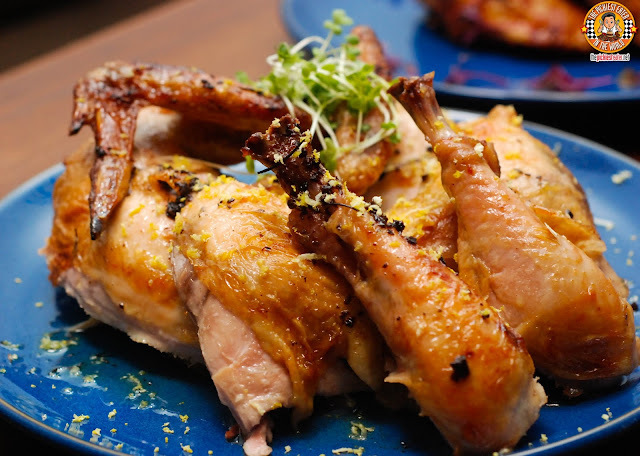 The rotisserie kept the chicken meat so remarkably juicy, and the gentle touch of herbs and Amber Butter, was a nice accentuation to its natural flavor. This has a more subdued flavor when compared to the other types of Roasts, so as much as I enjoyed this, I couldn't help but look for some kind of gravy to pair it with. Next up was the Poulet's Truffle Chicken. Chef Tom utilized truffle essence to imbibe the meat with a fragrance that tantalizes your taste buds. I really enjoyed this because the flavor of the truffle didn't overpower the flavor of the chicken, but enhanced it. My favorite was the South West BBQ Chicken. The chicken was basted in a sweet, smokey New Texas Style Rootbeer Reduction, that offers a gentle kick of heat. You may choose to pour extra sauce on to the chicken if you wish, but personally I liked it as is. In terms of price, Poulet Manilla's price range may come off a little bit daunting, but when you consider that it comes with side orders and is made with fresh quality ingredients, you tend to realize that its a small price to pay for a delicious meal that doesn't take a strong toll on your body.